, the famous pensionary of Holland, was the second son of Jacob De Witt, burgomaster of Dort, and deputy to the states of Holland; and born in 1625. He was educated at Dort, and made so great a progress in his studies, that at twenty-three he published “Elementa Curvarum Linearum” one of the ablest books in mathematics that had appeared in those days. After he had taken the degree of LL. D. he travelled for some years; and, on his return in 1650, became a pensionary of Dort, and distinguished himself early in the management of public affairs. He opposed with all his power the war between the English and Dutch, representing in strong colours the necessary ill consequences of it to the republic: and, when the events justified his predictions, gained so great credit, that he was unanimously chosen pensionary of Holland; first to officiate provisionally, and afterwards absolutely into the office. 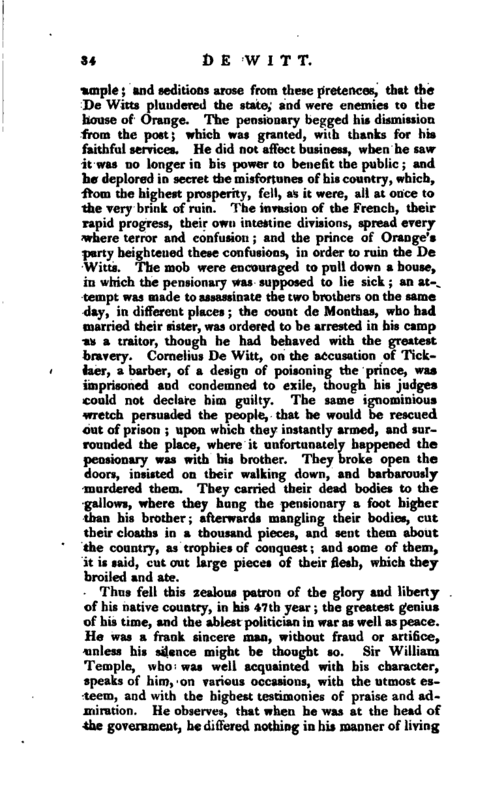 On this occasion, some of his friends, reminding him of the fate of his predecessor Barnevelt, he replied, that “human life was liable to trouble and danger; and that he thought it honourable to serve his country, which he was resolved to do, whatever returns he might meet with.” The continuance of the war was so visibly destructive to the commerce and interest of the | republic, that the pensionary with his friends used all their skill to produce a negociation. Ambassadors were sent to Cromwell, who by this time had called a new parliament. To this assembly the Dutch ministers were directed to apply, but quickly found them very different people from those with whom they had been accustomed to deal; for they entertained the ambassadors with long prayers, and discovered a total ignorance of the business, telling Cromwell, that, if he would assume the supreme authority, they might soon come to a right understanding. This was precisely what he wanted; and though he rejected their advice in words, declaring himself an humble creature of the parliament, yet he soon after found means to get rid of them, and took upon him the government under the title of protector. He then made a peace with the Dutch; the most remarkable condition of which was, the adding a secret article for the exclusion of the house of Orange, to which the States consented by a solemn act. But the article of the exclusion raised a great clamour in Holland: it was insinuated to be suggested to Cromwell by De Witt; and the pensionary and his friends found it difficult to carry points absolutely necessary for the service of the people. The clergy too began to meddle with affairs of state in their pulpits; and, instead of instructing the people how to serve God, were for directing their superiors how to govern their subjects. But his firmness got the better of these difficulties; and so far overcame all prejudices, that when the time of his high office was expired, he was unanimously continued in it, by a resolution of the States, Sept. 15, 1663. He seemed now to have vanquished even Envy herself. 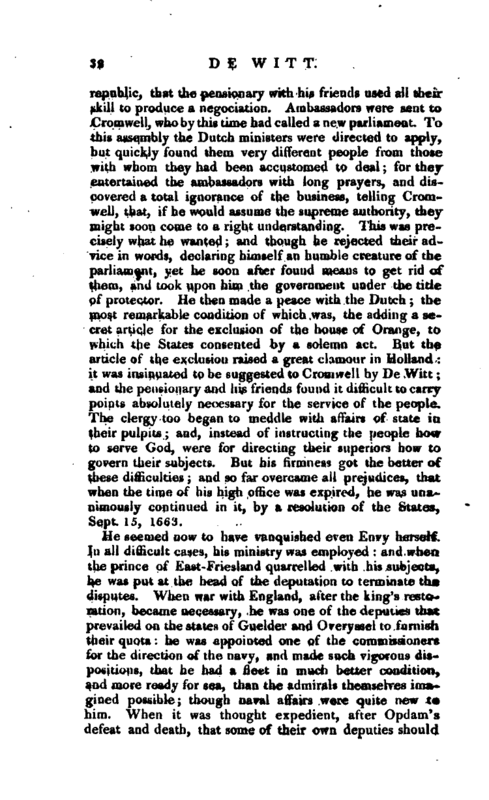 In all difficult cases, his ministry was employed: and when the prince of East-Friesland quarrelled with his subjects, he was put at the head of the deputation to terminate the disputes. 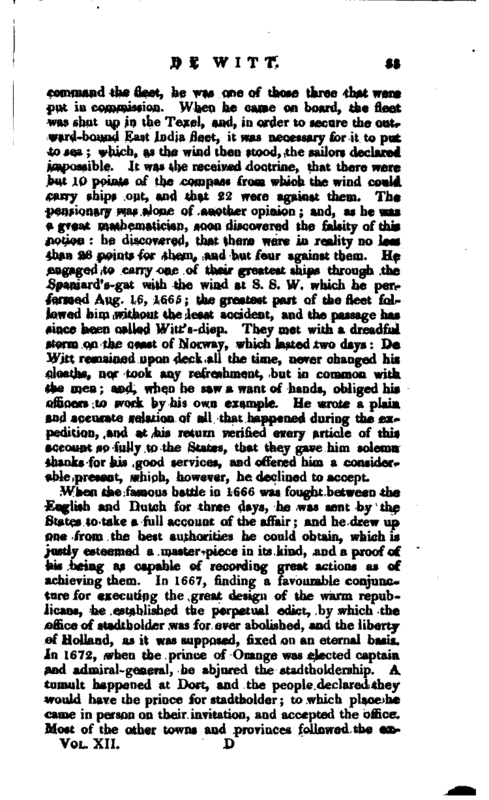 When war with England, alter the king’s restoration, became necessary, he was one of the deputies that prevailed on the states of Guelder and Overyssel to furnish their quota: he was appointed one of the commissioners for the direction of the navy, and made such vigorous dispositions, that he had a fleet in much better condition, and more ready for sea, than the admirals themselves imagined possible; though naval affairs were quite new to him. When it was thought expedient, after Opdam’s defeat and death, that some of their own deputies should | command the fleet, he was one of those three that were put in commission. When he came on board, the fleet was shut up in the Texel, and, in order to secure the outward-bound East India fleet, it was necessary for it to put to sea; which, as the wind then stood, the sailors declared impossible. It was the received doctrine, that there were but 10 points of the compass from which the wind could carry ships out, and that 22 were against them. The pensionary was alone of another opinion; and, as he was a great mathematician, soon discovered the falsity of this notion: he discovered, that there were in reality no less than 28 points for them, and but four against them. He engaged to carry one of their greatest ships through the Spaniard’s-gat with the wind at S. S. W. which he performed Aug. 16, 1665; the greatest part of the fleet followed him without the least accident, and the passage has since been called Witt’s-diep. They met with a dreadful storm on the coast of Norway, which lasted two days: De Witt remained upon deck all the time, never changed his cloaths, nor took any refreshment, but in common with the men; and, when he saw a want of hands, obliged his officers to work by his own example. 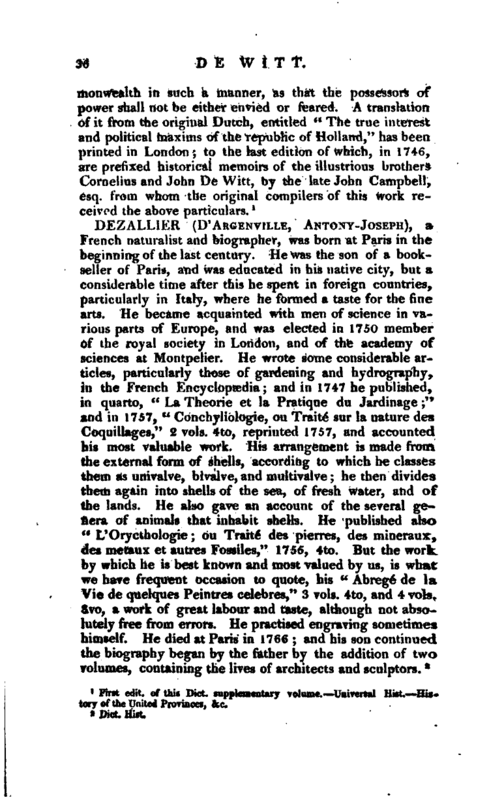 He wrote a plain and accurate relation of all that happened during the expedition, and at his return verified every article of this account so fully to the States, that they gave him solemn thanks for his good services, and offered him a considerable present, which, however, he declined to accept. When the famous battle in 1666 was fought between the English and Dutch for three days, he was sent by the States to take a full account of the affair; and he drew up one from the best authorities he could obtain, which is justly esteemed a master-piece in its kind, and a proof of his being as capable of recording great actions as of achieving them. In 1667, finding a favourable conjuncture for executing the great design of the warm republicans, he established the perpetual edict, by which the office of stacltholder was for ever abolished, and the liberty of Holland, as it was supposed, fixed on an eternal basis. In 1672, when the prince of Orange was elected captain and admiral-general, he abjured the stadtholdership. A tumult happened at Dort, and the people declared they would have the prince for stadtholder; to which place he came in person on their invitation, and accepted the office. Most of the other towns and provinces followed the | example and seditions arose from these pretences, that the De Witts plundered the state, and were enemies to the house of Orange. The pensionary begged his dismission from the post; which was granted, wiih thanks for his faithful services. 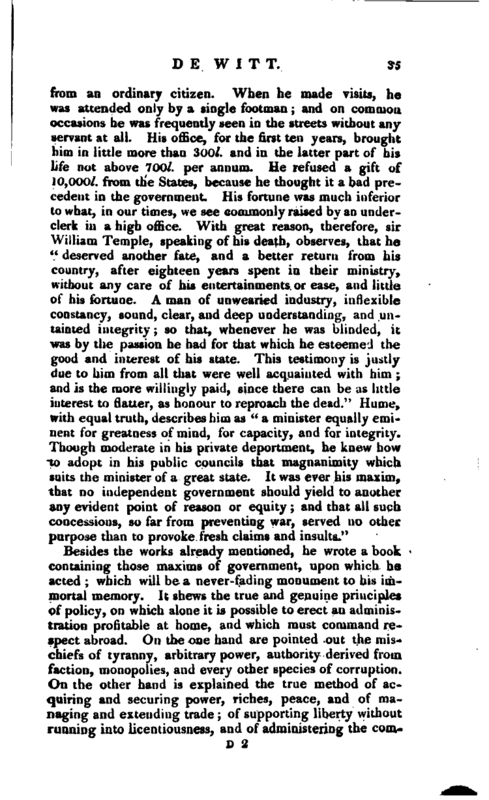 He did not affect business, when he saw it was no longer in his power to benefit the public; and he deplored in secret the misfortunes of his country, which, from the highest prosperity, fell, as it were, all at once to the very brink of ruin. The invasion of the French, their rapid progress, their own intestine divisions, spread every where terror and confusion; and the prince of Orange’s party heightened these confusions, in order to ruin the De Witts. The mob were encouraged to pull down a house, in which the pensionary was supposed to lie sick; an attempt was made to assassinate the two brothers on the same day, in different places; the count de Monthas, who had married their sister, was ordered to be arrested in his camp as a traitor, though he had behaved with the greatest bravery. 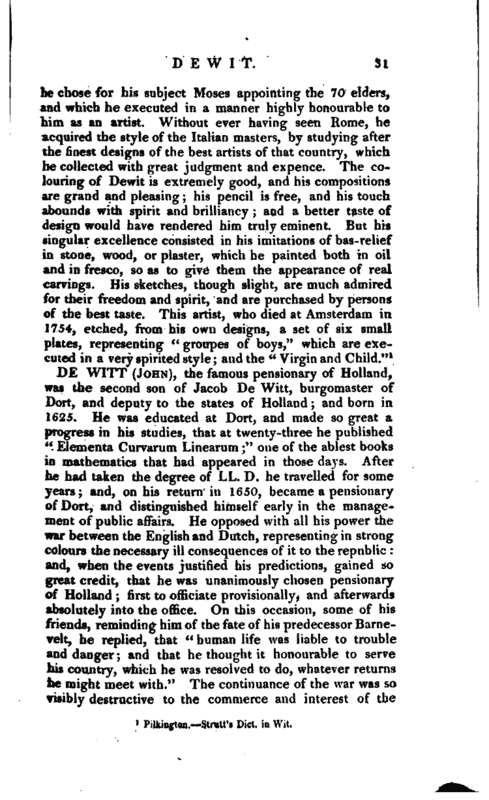 Cornelius De Witt, on the accusation of Ticklaer, a barber, of a design of poisoning the prince, was imprisoned and condemned to exile, though his judges could not declare him guilty. The same ignominious wretch persuaded the people, that he would be rescued out of prison; upon which they instantly armed, and surrounded the place, where it unfortunately happened the pensionary was with his brother. They broke open the doors, insisted on their walking down, and barbarously murdered them. They carried their dead bodies to the gallows, where they hung the pensionary a foot higher than his brother; afterwards mangling their bodies, cut their cloaths in a thousand pieces, and sent them about the country, as trophies of conquest; and some of them, it is said, cut out large pieces of their flesh, which they broiled and ate. First edit, of this Dict. supplementary volume. Universal Hist. History of the United Provinces, &c.